Political opponents of the 3 million–member National Education Association probably feel the union couldn’t be more partisan, difficult, or dismissive of education reforms it opposes. But in some cases, the union’s leadership structure acts as a moderating influence on the more radical proposals presented by its activist members. 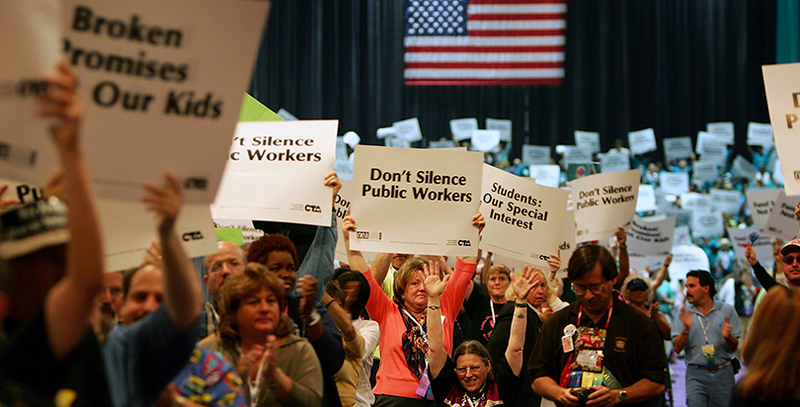 Each year at NEA’s Representative Assembly, some 7,000 delegates introduce approximately 125 new business items (NBIs) for debate and vote. Many of these come from California, and a disproportionate number from union affiliates in the Bay Area. These agenda items tend to call on NEA to take more extreme measures against charter schools, corporations, and opposing advocacy organizations. Many of them are defeated by a majority floor vote of the delegates, but others pass or are referred to the union’s executive committee. When these items are placed in the hands of the union’s officers for implementation or final disposal, the extent of the actions taken sometimes doesn’t match up with the item’s intent. Some NBIs are straightforward and are dealt with in the same way. One approved NBI from the 2016 Representative Assembly directed NEA to donate $10,000 to the Save Our Schools March. NEA did just that. Other implementations aren’t so clear. One 2015 item directed NEA to “actively engage in conversation and outreach on the NEA endorsement process with all 2016 Presidential campaigns prior to the consideration of a primary recommendation.” Although NEA did perform outreach to all candidates, we know from the hacked emails published by Wikileaks that the NEA leadership was already committed to endorsing Hillary Clinton soon after she announced her candidacy. Referrals by the delegates give the union’s highest-ranking elected officers free rein to deal with agenda items. Items calling for boycotts are automatically referred, and delegates in 2016 introduced one. It actually would be a lot easier to boycott Walmart than it would some other NEA opponents. To protest the activities of the Gates Foundation, could you organize an effective boycott of Microsoft? How many members could you get to stop using Windows? Another NBI directed the union to seek out “pro–public education Republican candidates” and encourage them to participate in the union’s endorsement process. NEA stated that this was already being done through a “strategic relationship” with the Republican Main Street Partnership and the Tuesday Group, both of which are caucuses of moderate congressional Republicans. I don’t know of any instance in which NEA interpreted an NBI in such a way that the union ended up taking more extreme action than was called for. This suggests that, contrary to popular belief, the union hierarchy acts more reasonably in some cases than its most committed activists. Disclosure: The Bill & Melinda Gates Foundation and the Walton Family Foundation are supporters of The 74.